Pop. 713,777Detroit’s name comes from the Detroit River, which served as a major port at the time of its founding in 1701. France catalyzed the city’s growth by offering free land to families in the 1700s. As the city expanded in the 1800s and was passed to the United States, it became a major transportation hub and saw the rise of shipping, shipbuilding, and manufacturing industries. Detroit is well known for its reputation as the core of the American automobile industry owing to Henry Ford, but the industry has since declined and left its economy struggling. Detroit has been a hub of militant Labor and community organizing, spawning such groups as the League of Revolutionary Black Workers and social theorists such as James and Grace Lee Boggs. Long-running redevelopment plans have been in order since the 1970s, namely the “Detroit Renaissance” which aimed for new business and industrial facilities, improved public and recreational spaces, and better housing. The same Detroit River it was named for now runs along a number of high rise residential buildings, skyscrapers, and parks. Notes: The Maps were handed out to participants during the “Research for the Revolution: Radical Research Strategies for Movement Building” workshop organized by Team Colors Collective. NPA has always been conceived as a research tool and sharing the maps in the context of a presentation about AREA helped to illustrate how the magazine and organization simultaneously document, produce and dissiminate research about Chicago and how that process has been adapted to other cities. 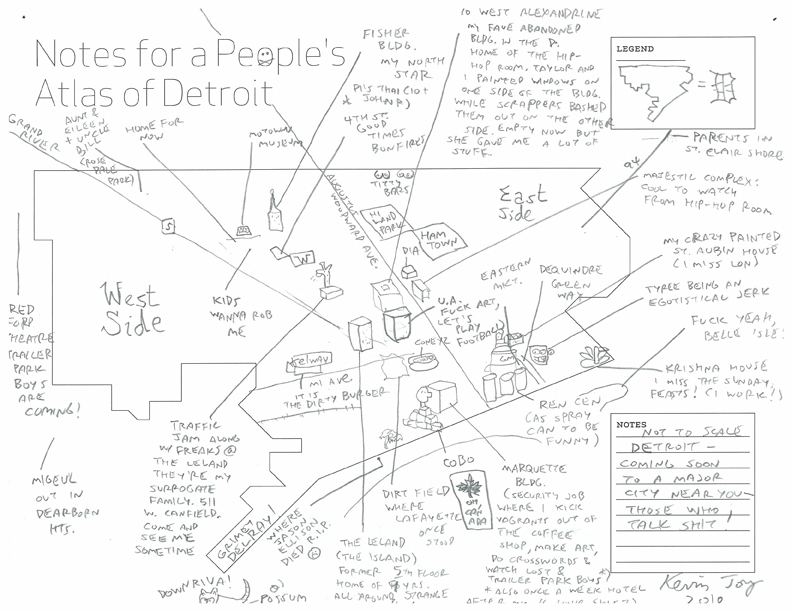 The maps were used later in the fall of that year for the exhibition “Considering The City.” The two contexts provided diverse perspectives with the Social Forum panel consisting of activists from outside of Detroit and the exhibition space largely attracting artists from Detroit.